This is an old pic, but a classic. I thought I’d lost it, but it showed-up while sorting through some old files on the computer. I did once ask someone at Ventura about it — he said one of their staff had taken the photo, and from memory also said there had been no serious injuries — which means you don’t have to feel guilty if amused. I don’t suppose that the incident was staged just for a photo (car already damaged moved into place, bus not damaged at all)? What do people think? The nose-down angle of the car indicates it was braking heavily at the time of impact. The front bus wheels are turned away from the car – the driver instinctively tried to steer away from the approaching car. Debris can be seen on the road, and liquid from the coolant system can be seen on the road at the rear of the car. The bus is damaged – you can see the popped panelwork above the car. All this could be faked, of course, but why would anyone go to those lengths? For reference this is at the corner of Howleys Road and Ferntree Gully Road in Notting Hill. The bus would have been turning right into Ferntree Gully Road. 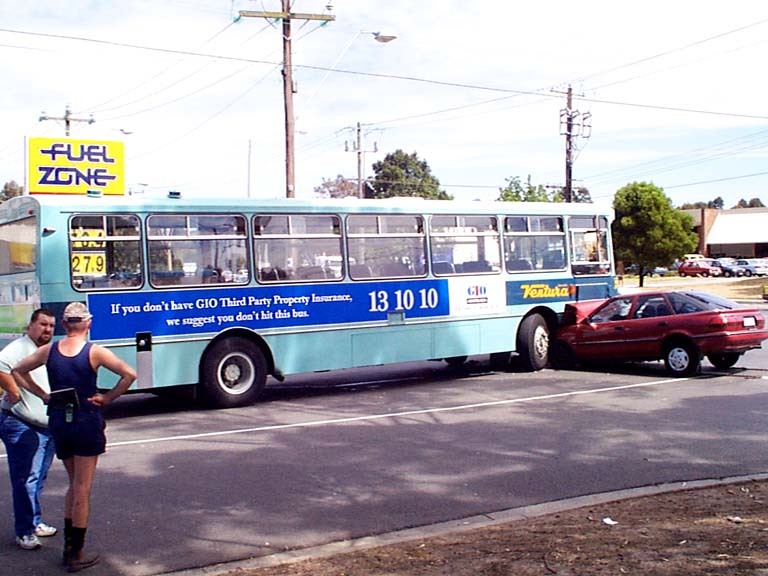 I think this was in the late 90s (maybe early 2000s) and the bus would probably have been a 737 Monash Uni to Croydon. I also recognised the location. Given it is on Howleys Rd, it is more likely to be the 742 bus. It’s hard to tell because the routes have been changed since that time. That guy on the left looks like he has a spare laptop computer shoved down the back of his shorts ?